MADRID | Habitat Bankia, BFA Group-Bankia’s property company, announced it has sold over 2,400 real estate assets between January and June of this year. The value of these operations amounts to €230 million. These units from foreclosed assets and the pace of divestment reflects an increase of 17% year on year. In a market environment characterised by continued declines in sales and purchases, the decision of downsizing its real estate portfolio is a clear message to the markets that the entity has speeded up the restructuring of its balance sheet. Adding the subrogation from property developers and unique asset transfers, including building land and property developments, the number of real estate assets the group has divested is of over 6,700 units worth €760 million. “Bankia Habitat is developing an active trade policy by periodically reviewing the prices of assets in order to adapt to market realities,” the entity explained. As a result, the property company has launched several marketing campaigns. With the last one, which opened on July 23 and had an initial term of one week, Bankia Habitat offered discounts of between 40% and 60% in more than 500 buildings. The company said it has received 426 offers, and it has decided to extend the prices received for this campaign for several weeks. Within this programme there are 151 apartments located in Benidorm (Alicante), Manresa (Barcelona), Moncofar (Castellón), Yebes (Guadalajara) and Seville, as well as 240 houses for sale in Madrid, in Parla, and in Humanes de Madrid. The group is stepping up marketing efforts through more than 3,200 offices and via various channels, including dealers and estate agents. Also, part of the revitalisation of transaction activity is also due to the creation, on March 15, of the www.bankiahabitat.es web. Bankia Habitat is the group company that brings Banki-BFA’s real estate assets together. It has become one of the management companies and one of the sales channels of relevant properties in the Spanish market. Press reports today in Spain affirmed the €100 billion bailout for the country’s banking sector, particularly for Bankia, could be delivered during this summer. 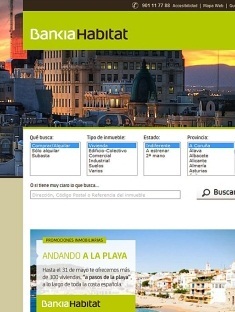 Be the first to comment on "Bankia accelerates real estate asset sales ahead of bailout"